If I am ever able to decorate my apartment exactly as I would like to, I plan to shop for all the furniture at Hallands Auktionsverk. Not sure how I'm going to ship it back to New York. (This whole fantasy includes winning the lottery.) Hallands is in the town of Halmstad on the west coast of Sweden, about two hours outside of Copenhagen in Denmark. 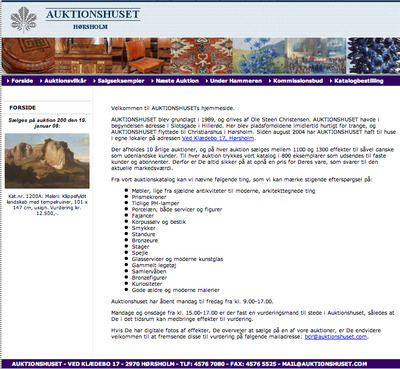 Click "auktioner" on the left, and their list of auctions come up. Hit the "katalog" icon, pull down "alla" and let the thumbnails load. There's tons of pretty estate furniture–hello, Carl Larsson–art, lighting, and smalls. (Container share, anyone?) No English language options here, but if you want it, you'll figure it out. 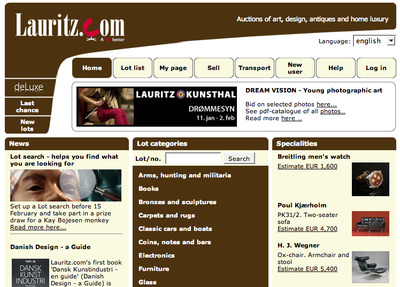 When I visited Copenhagen in 2000, a traditional show-room style auction house named Lauritz Christensen was making its internet bid. "How quaint," I thought. "Poor little Danes, eBay is going to squash them like a bug." Boy, was I wrong. 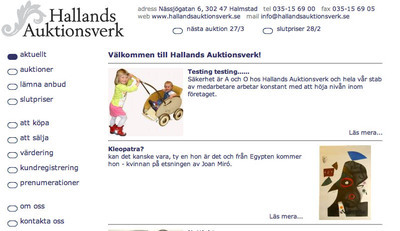 It seems every time I check their site they've bought another Mom and Pop auction house and marched further across Scandinavia. One of the oldest auction houses in Denmark, Laurtiz is now also the biggest, and has expanded into Sweden, Norway and Germany. While New Yorkers are anticipating Americana week, I have to admit it, I prefer looking at foreigner's old things. Thanks to the internet, we can surf auction houses all over the world, and the best ones don't even co-list on eBay yet. I'm starting this feature by introducing Auktionhuset in Horslom, which is somewhere north of Copenhagen (thank you, Google). I found them a few years ago by doing a search for an obscure Danish artist that I collect. I can't make much sense of their website–although I can guess what "naest auktion" and "under hammeren" mean–which is part of the fun. If you see something you really want, make very sure of the commission and shipping charges before you bid, and get ready to deal with a lot of international confusion. In my case, it was over a month before Auktionhuset let me know I'd won the auction. But every time I look at my Vilhelm Th. Fischer ducklings painting, I think: totally worth it.